ALEXANDER, (Second Century), a bishop in Greater Rome, St. Alexander was arrested and tortured after his miracles brought him to the notice of the authorities. He was beheaded on the Claudian Way, about thirty kilometres (twenty miles) from Rome. In the fourth century his relics were translated by Pope St. Damasus (11th December) and enshrined in Rome. GERULPH, a Flemish nobleman and heir to a vast estate, killed (circa 746) shortly after Chrismation by an avaricious relative, whom St. Gerulph pardoned with his dying breath. MABYN, (Sixth Century), according to Cornish tradition, St. Mabyn was one of the many children of King St. Brychan of Brycheiniog (6th April). The village and civil parish of St. Mabyn is named for her, and St. Mabyn Parish Church located in St. Mabyn, Cornwall, England, is said to have been founded by her. The earliest mention of her is in a twelfth century Life of St. Nectan (17th June). The saints Mabon and Mabenna are often mentioned either together or, are conflated, and are generally associated with St. Teio (9th February). Baring-Gould speculates that St. Mabon may have been St. Teio’s brother and the true founder of the parish church, as well as Llanvabon (a parish in South Wales), and that the attribution to a female St. Mabyn came about after the true history had been lost. 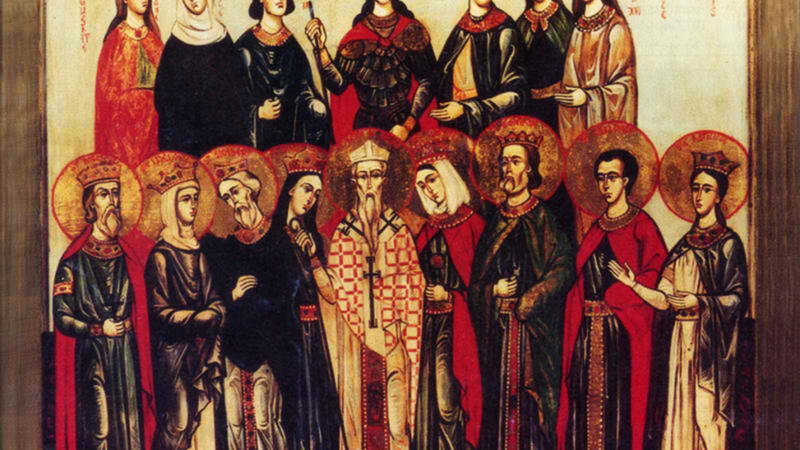 The only certainty regarding these saints is that they have had a strong cultus in Wales and Cornwall, are associated with St. Teio, and have lent their names to some locations in Wales and Cornwall. MAURA, a young maiden in Troyes in Champagne, who dedicated her brief life to prayer and good works. St. Maura reposed in 850, at the age of twenty-three. PAMPHILUS, (Date Unknown), an early martyr in Rome of whom nothing further is known.